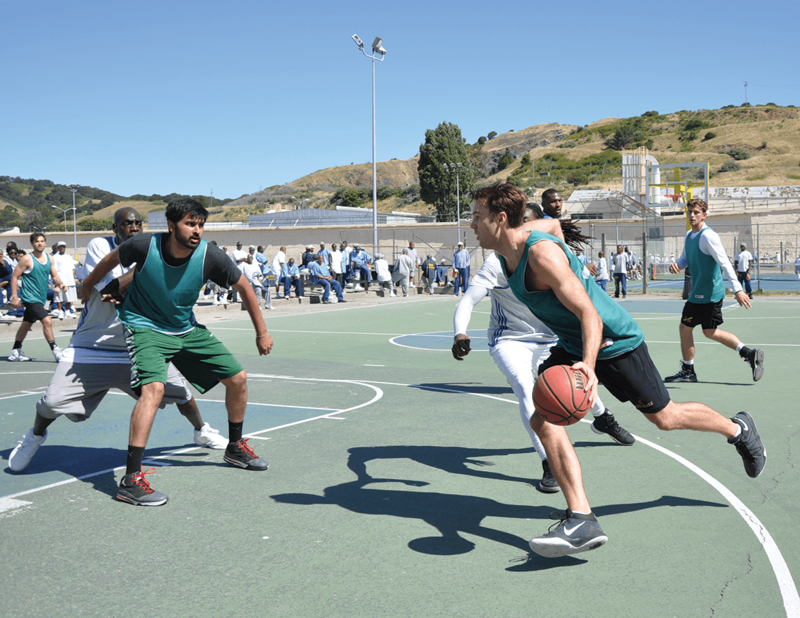 The San Quentin Warriors hung with a Green Team stacked with former pro basketball players but their valiant effort fell short in the final minute of a 70-66 loss. The Prison Sports Ministry’s “Green Team” has a roster of over 40 basketball players on an email list that they blast out before each game to see who’s available to play. After losing two of their first three games of the season, sponsor Bill Epling challenged the Green Team to respond—and four former pros did. Besides Fjeld, the former pros included Reilly Griffin, who played pro in Spain up until 2014. Then there was the 32-year-old John Smith, who played pro in Asia for six years and whose uncle is the all-star Phil Smith, who won the 1975 NBA championship with the Golden State Warriors. Last, Dan Wohl, who played pro in Israel and played in the first Green Team loss of the season, returned. In addition to the professional level talent, were Pat Lacey and his band of former Claremont-McKenna college players like Riley Hall, Kevin “K-Mac” MacPherson and Ben Bergsma plus David Liss, who played for Pomona, and KJ Logue, a Cal Poly basketball team 2016 graduate. “No matter who we bring in here, it’s always a battle the Warrior squad represents” Griffin said. The score went back in forth in short spurts with the intensity of the NBA finals. The game came down to the final seconds and a blown lay-up. Before 100 San Quentin spectators on a sunny day, the Warriors were down 68-66 with 30 seconds left on the clock in the fourth quarter. Warrior 5-foot-4 point guard Walter Cook brought the ball down court, shook the defenders and got to the rack. However, he over shot the lay-up that would have tied the score. “The seas parted—I thought for sure we were going to overtime,” Griffin said. Fjeld grabbed the rebound and the Warriors fouled him to stop the clock. He made both free throws, which increased the lead to 70-66 with :03 left. SQ Warriors Center Harry “ATL” Smith launched a three at the buzzer that missed. Fjeld, who got hot in the second half, led all scorers with 16 points, followed by Griffin with 14 points and 13 rebounds. Liss dropped 12 points after hitting four three-pointers in the second half. Wohl added 7. For the Warriors, Tevin Fournette led his team with 14 points, followed by Allan McIntosh with 12 and both Smith and Cook contributing 10 points each. John Smith shared the reason why he likes to play basketball at San Quentin.